Honest dogs—I first came across those words in Gary Paulsen’s book, Woodsong, used to describe one of his dogs, Storm. Paulsen defined Storm as a dog who always worked, always pulled, ran many miles, and taught Gary many things about life. 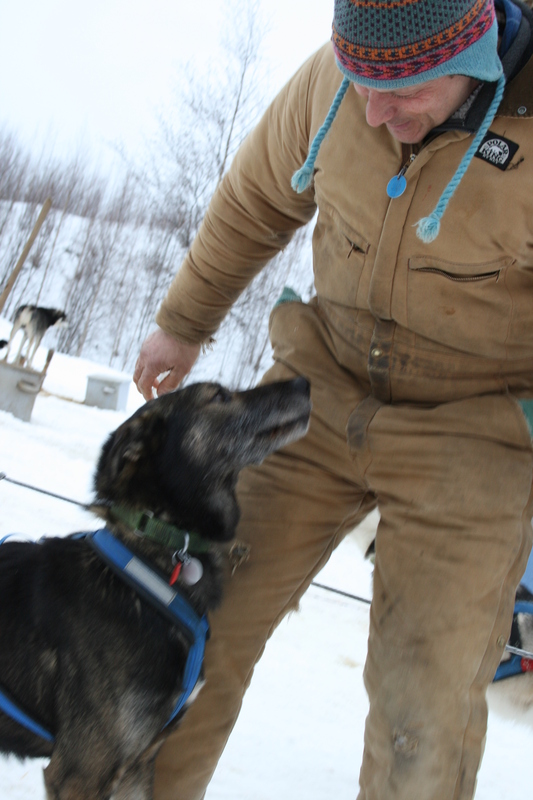 Pam says it’s the musher’s job to find out what the reason is and to take care of it. A dishonest dog is one who has learned to keep the line just tight enough to make it look as if the dog is pulling, but he isn’t. I don’t mind if a dog eventually goes off the line during a long run as long as he or she gets back to work on their own. Taking a break is fine by me, the honest part is that the dog does not lay down or quit. If I’m stupid, I can make any dog quit. One has to find what is possible to ask, what can be given. How does a musher know if a dog is pulling or not? They keep an eye on the line from the harness tug to the gangline. If it’s tight, the dog is pulling. If it isn’t, the dog is taking a break. So, after I gathered all this information about honest dogs, I started thinking how this is an example of figurative language and how it relates to people. Usually, we think of honesty as a the quality of being truthful, saying what is true. But, honesty can show in actions, too. How do we people know when other people are working like honest dogs work? We don’t have harnesses, tugs, and ganglines to look at. I think people listen to what we say we will do, and then people watch to see if we do what we said we would do. People watch to see if we carry out our responsibilities or not. Carrying out our responsibilities is like keeping the line tight. Some people call this “talking the talk and walking the walk”. You do what you say you’re going to do. Hardworking, “honest” people take breaks too, to recharge or to consider another way to get something done, causing their line to go slack for a little while. They get back to work, tightening their lines on their own. And if an honest person falters or hesitates, the reason they do so is an honest reason, a real reason. When people offer excuses or dishonest reasons for not getting something done, then it’s like being a dishonest dog—pretending to do the work, but not really doing the work. The line looks tight, but the job isn’t getting done. And, as a teacher or employer or co-worker, think about Martin’s statement that if he’s stupid, he can make any dog quit, that it’s up to him to find out what is possible and what the dog can give. Seems like that’s advice for folks who work with students, employees, and colleagues, too, not just mushers. ← Something to Do While You Follow Me!